Born: 1852, Hambleton, Hampshire, England. Died: Date not known, United Kingdom. Charles Aburrow, son of William Aburrow, was educated at a school in Brighton, England, and completed an apprenticeship with Francis Newman, a surveyor, architect and civil engineer on the Isle of Wight. He spent nine years with the firm, gaining considerable experience. He then joined the contractors Mowlem & Burt of London. In 1879 he came to South Africa to take up an appointment as engineer to the London and South African Exploration Company in Kimberley. In 1882 he was the honorary secretary of the first professional association of engineers and related professions in southern Africa, namely the South African Institution of Engineers, Architects, and Surveyors, which flourished briefly in Kimberley in 1881 and 1882. He was also a meteorological observer in Kimberley for the Cape of Good Hope Meteorological Commission from 1884 to1888. In 1889 Aburrow moved to Johannesburg to practice as a civil engineer and played a prominent role in the affairs of the South African Association of Engineers and Architects. He acted as honorary secretary at the preliminary meetings to found the association during 1892, was a member of its first council, and in 1894/5 served as its third president. In December 1893 he read a paper on "Public baths" before the association (published in its Proceedings, Vol. 1, pp. 82-87) and in April 1994, with G.S. Burt Andrews*, another on "Isolation hospitals" (Proceedings, Vol. 1, pp. 107-112). He was also a foundation member of the Geological Society of South Africa (1895) and served on its council during 1895-1897. In May 1893 Aburrow succeeded W.H. Miles as Town Engineer of Johannesburg. As the streets were in very poor condition he obtained estimates for asphalt or wood-block surfaces, but both proved too expensive. In May 1895 he presented a preliminary proposal on a sewer system for Johannesburg. The plan was approved, but the project was delayed for many years owing to a lack of funds. When the Anglo-Boer War (1899-1902) began he left Johannesburg and remained in the Cape Colony until October 1900. 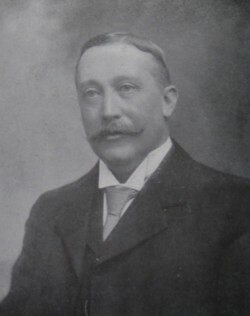 After the British takeover of Johannesburg he resumed his duties, but was dismissed in May 1901, probably because he had clashed with the new town clerk. In 1899 Aburrow was responsible for one of the limited number of second order meteorological stations maintained by the Cape of Good Hope Meteorological Commission. Although his observations for 1899 were interrupted by the outbreak of the Anglo-Boer War, he continued them in 1900 and 1901. His only publication on meteorology, "Rainfall at Johannesburg", appeared in the Quarterly Journal of the Royal Meteorological Society (Vol. 24, p. 215) in 1898. It consisted of a table of mean monthly rainfall figures for Johannesburg during 1889-1897, based on the annual reports of the Public Works Department of the city of Johannesburg. After his dismissal Aburrow began practising as an architect and civil engineer in the firm Aburrow & Treeby and supervised several large building projects in Johannesburg. The partnership was dissolved by mutual consent in 1922, after which he returned to England. He was a founding member of the South African Association for the Advancement of Science in 1902, and in 1903/4 served on the committee for Section C, which at that time included engineering and architecture. He remained a member for many years and served on the association's council for 1918/9. In 1917 he furthermore became a founding member of the South African Geographical Society. He was also a fellow of the Geological Society of London, a member of the (British) Society of Architects, an associate member of the (British) Institution of Civil Engineers, and deputy grandmaster of the English freemasons in the Transvaal. Artefacts, at http://www.artefacts.co.za/main/Buildings/archframes.php?archid=1962 as on 2015-8-6. Cape of Good Hope. Report of the Meteorological Commission, 1884-1901. Diamond Fields Advertiser, 19 April 1882, p. 2: Advertissement: SA Institution of Engineers, Architects and Surveyors. Draper, J.R. 1967. The engineer's contribution. A history of the South African Institution of Mechanical Engineers, 1892-1967. Johannesburg: SAIME. General Directory of South Africa, 1916. Geological Society of South Africa. Transactions, Vol. 1-2, 1895-1897. Shorten, J.R. The Johannesburg saga (pp. 569-571; surname wrongly given as Aberrow). Johannesburg: J.R. Shorten, 1970. South African Association for the Advancement of Science. Report, 1903, 1904, 1905/6, 1910, 1918: Lists of members and office bearers. South African Association of Engineers and Architects. Proceedings, Vols 1-4, 1892-1898. South African Geographical Journal, Vol. 1, No. 1, pp. 36-37, list of members.